Lightly draw text or a design onto the papier-mâché ornament using a pencil. Paint the ornament as desired. Let dry. Apply tacky glue over the text/design. Use a toothpick to spread the glue so that it covers each letter. Note: You could also use a paint brush, but a toothpick can give you better control. Working over a paper plate, sprinkle beads over the glue. Gently press the beads into the glue. 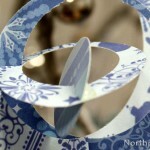 Note: For 3D ornaments, use tape to hang it from the edge of the table. Repeat steps 3–5 if you want to add glitter or any other embellishments. Completely cover it with beads. Use pearl and clear beads to make any design you like. Add extra sparkle with microbeads and glitter. Here we used microbeads on the letters and white glitter for snowcaps at the top and bottom of the ornament.